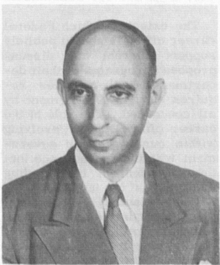 Helmut Erich Landsberg (1906–1985) was a noted and influential climatologist. He was born in Frankfurt, Germany, February 9, 1906 and died December 6, 1985 in Geneva, Switzerland while attending a meeting of the World Meteorological Organization. Landsberg was an important figure in meteorology and atmospheric science in education, public service and administration. He authored several notable works, particularly in the field of particulate matter and its influence on air pollution and human health. He is the first to write in English about the use of statistical analysis in the field of climatology and implemented such statistical analysis in aiding military operations during World War II. He received a number of significant honors during his life. Several honors are now bestowed in his name in recognition of his contributions to his field. Landsberg's early publications dealt with earthquakes, the impact of weather on aviation, atmospheric suspensions and, most notably, cloud condensation nuclei. Landsberg published a ground-breaking worn on condensation nuclei, the submicrometre-sized particles in the air about which clouds form, which was the first to examine the role such particulate matter plays on air pollution and the degree to which it is retained in the respiratory system. This investigation was the basis of his later work on the impact of urbanization on climate. He also linked falling pressure to the onset of non-induced labor in childbirth. Throughout the 1940s, Landsberg focused on climatology. He introduced English-speaking audiences to the usefulness of statistical analysis in the field in his 1941 book, Physical Climatology. Landsberg received a number of honors and recognitions throughout his career. Among his notable honors were the International Meteorological Organization Prize (1979), the William Bowie Medal of the American Geophysical Union (1978), the Outstanding Achievement in Bioclimatology Award (1983) and the Cleveland Abbey Award (1983) of the American Meteorological Society, and the National Medal of Science (1985), presented to him by US President Ronald Reagan. Weather and Health: An Introduction to Biometeorology, last published in 1969. Weather, Climate and Human Settlements, last published in 1976. ↑ Helmut Erich Landsberg The Department of Atmospheric and Oceanic Science. University of Maryland. Retrieved 2008-08-30. ↑ Henderson, Gabriel (2014). "The Dilemma of Reticence: Helmut Landsberg, Stephen Schneider, and public communication of climate risk, 1971-1976" (PDF). History of Meteorology. 6. ↑ Landsberg, Helmut (December 18, 1970). "Man-Made Climatic Changes". Science. 170 (3964): 1265–1274. Bibcode:1970Sci...170.1265L. doi:10.1126/science.170.3964.1265. ↑ Staff (April 1967). "New Director of Environmental Data Service" (PDF). ESSA World. Environmental Satellite Services Administration: 26.